The picture of N. P. Krymov “Towards the Evening” is one of those paintings by great artists who are unfairly deprived of attention. But this picture reveals a very subtle facet of life in the village, the beauty of rural nature. 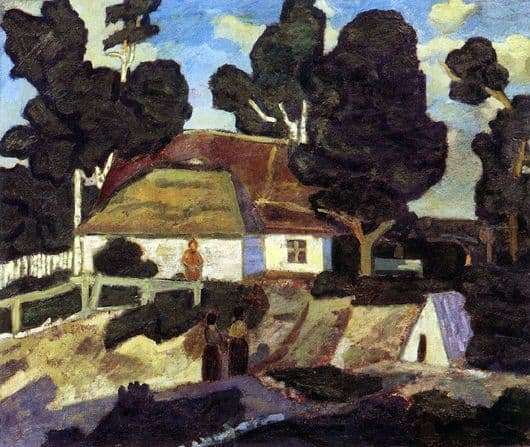 Of course, in his work Krymov wanted to reveal the essence of the so-called hinterland. The painting depicts rural whitewashed huts with thatched roofs, a cellar, and a calm conversation between two girls in the foreground. The majestic trees in the background emphasize the thoroughness and stability of the way of life of the villagers. The picture is painted in pastel dark colors, emphasizing the evening time of day. An elderly woman, depicted in the distance, looks at the girls with a wise, tired look. The picture is written in broad strokes, without drawing individual details, which once again shows the artlessness of the simplicity of life in the village. Trees with their crowns, as if covering this family comfort from adversity and bustle of city life, not familiar and not accepted by ordinary people. The last rays of the setting sun illuminate the blue sky and white clouds that will soon disappear in a quiet country night. After an intense day-to-day peasant labor, this hour before going to sleep appears to us in the picture of the outstanding Russian artist Nikolai Petrovich Krymov as real bliss for tired and weary women. The painting “By the Evening” was painted in 1913. The artist knew firsthand about the lives of ordinary village people. The artist looks at this landscape through the eyes of a city dweller. Therefore, the feeling of “imaginary” carelessness of village life is transmitted very clearly. And therefore, to everyone who sees this picture, that feeling of peace, composure and tranquility is transmitted.